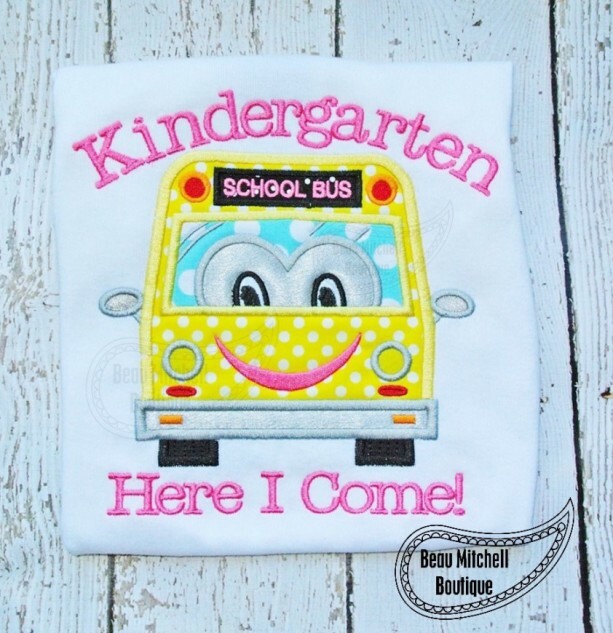 Perfect back to school shirt for your little one! Pre-School, 1st and 2nd grade versions are also available. Fabrics may differ slightly but will always coordinate perfectly! Thread colors can be changed for boys. It's always best to measure child prior to ordering to ensure a proper fit. If you'd like the measurements of the shirts I currently have in stock, please ask. Matching tutus and hair bows are also available for girls. Looking for a different theme or character? Please contact me and together we will design something special just for you. Details about my garments: I use a variety of different shirts, including, Carter's, Child of Mine, Garanimals, Jerzees, Old Navy, Gildan, Fruit of the Loom, Hanes etc. depending upon what is available at the time of purchase. ♥Add me to your favorite shops! Thanks for looking!